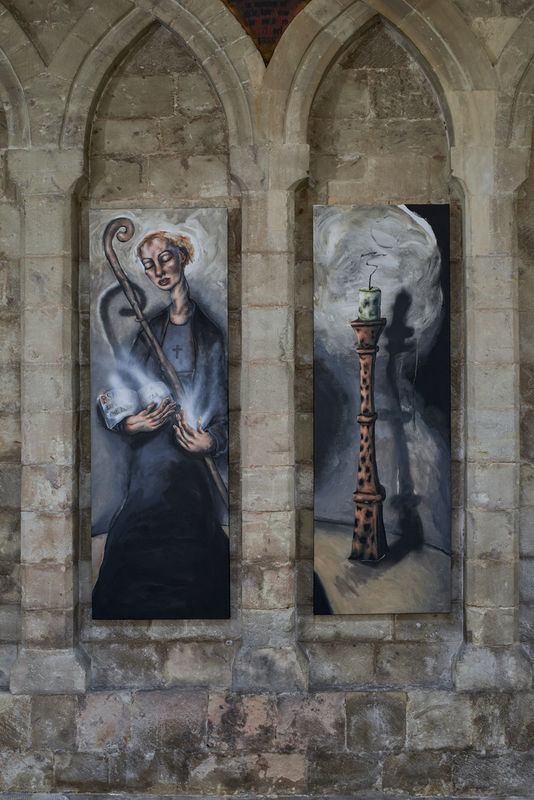 ‘St Ethelflaeda’ by Chris Gollon is a site-specific diptych painted for Romsey Abbey, Hampshire. It has now been purchased by Romsey Abbey and is to be permanently installed in October 2018. A new exhibition catalogue is being published to coincide with the installation, with texts by leading writers including Sara Maitland. Chris Gollon’s diptych shows the 10th century Abbess St Ethelflaeda, when—as legend has it—she entered the Abbey a gust of wind blew out her candle; but a Divine light then emanated from her fingers enabling her to carry on her lecture of the Bible. As ‘Incarnation, Mary & Women from the Bible’, Chris Gollon’s national touring exhibition to English Cathedrals, came to Romsey Abbey in October 2016, he was very taken with the various legends of St Ethelflaeda and asked if he might paint her, specifically for an arcade of bare stone niches in the south nave. Gollon’s diptych painting seems to create a passageway through which St Ethelflaeda re-enters the Abbey from the nunnery. As it was unveiled, there was a strong feeling among onlookers that her physical presence was suddenly felt again in the Abbey.